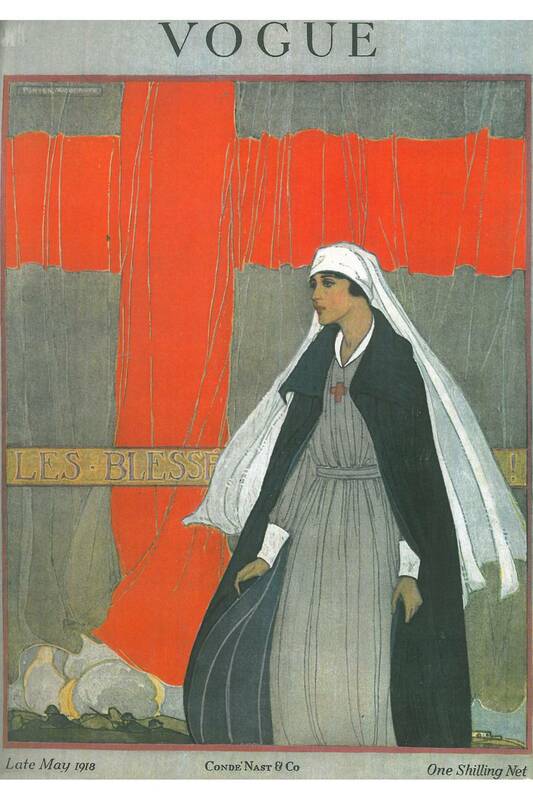 Red Cross worker on the cover of Pictorial Review magazine, July 1917. Image: eBay. This year marks the centennial of the beginning of World War 1. 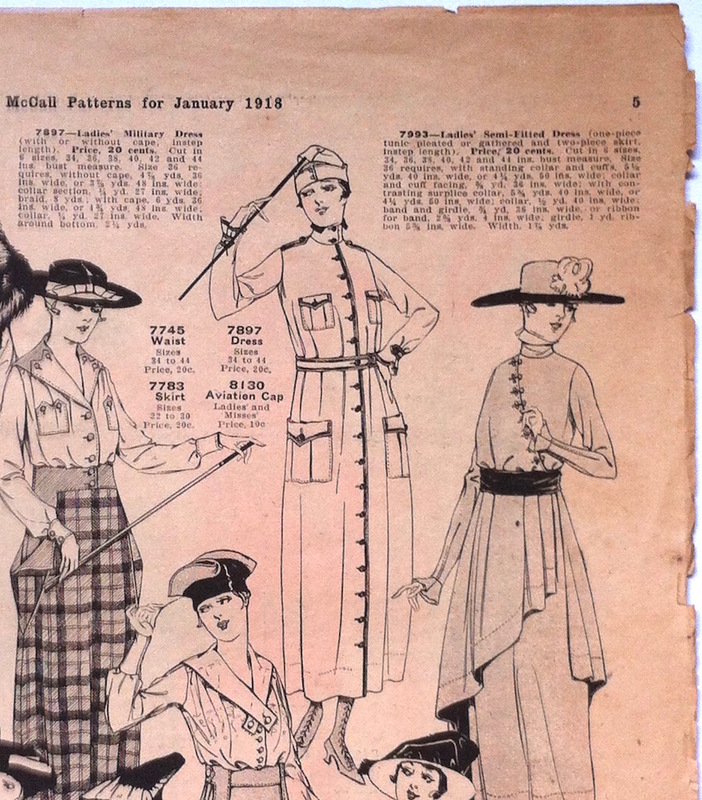 In honour of Armistice Day, this post looks at commercial sewing patterns associated with the First World War. 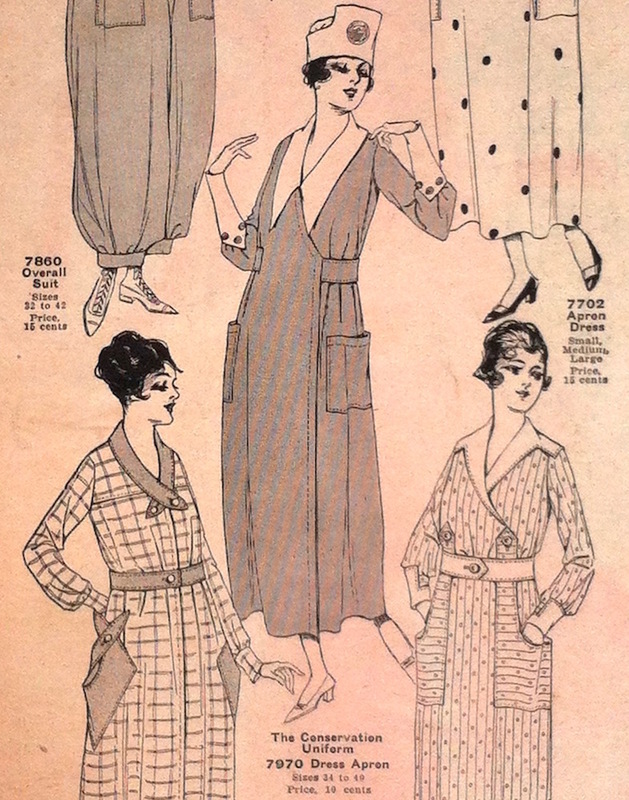 British Vogue, May 1918. Illustration: Porter Woodruff. Image: Vogue UK. “Responding to the Country’s Call.” McCall’s magazine, July 1917. Image: eBay. 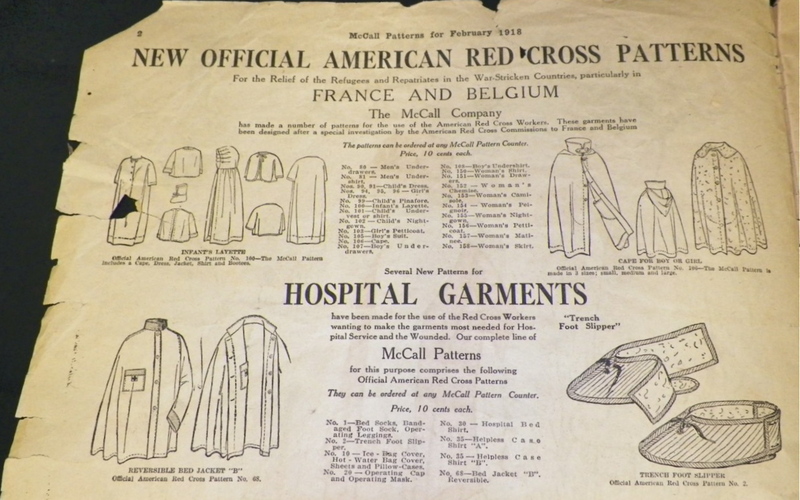 Official Red Cross patterns exemplify the volunteer production of clothing and medical supplies that formed part of the war effort. American Red Cross patterns were published by multiple American pattern companies, while in the U.K., British Red Cross sewing and knitting instructions were available in several books by Emily Peek. 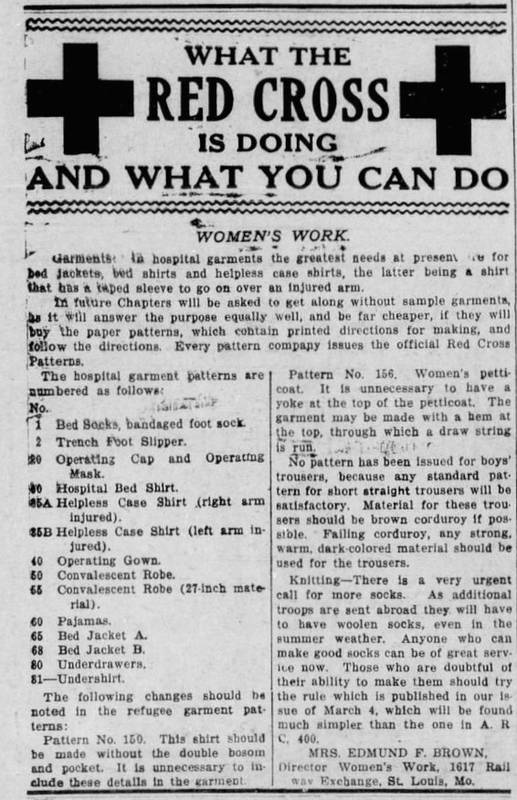 * In Canada, volunteers sewing for the Canadian Red Cross may have used both British and American resources. Working Uniform (B.R.C.S.) 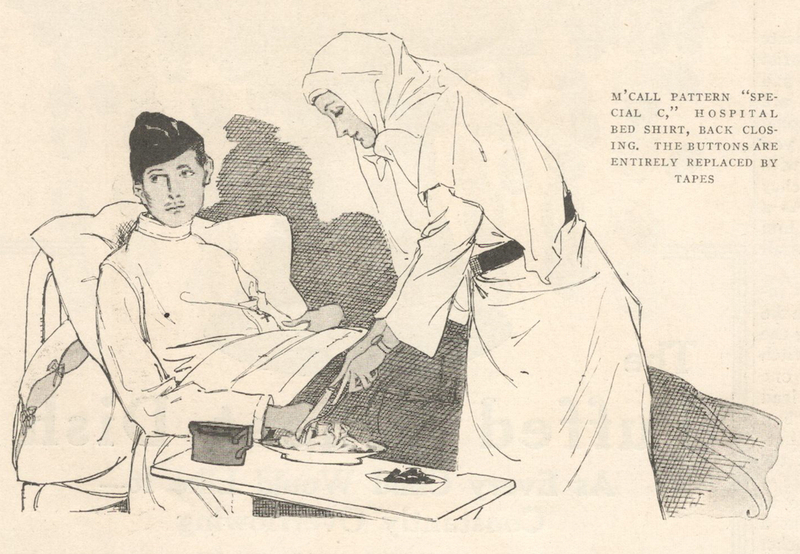 in Emily Peek, Practical Instruction in Cutting Out and Making Up Hospital Garments for Sick and Wounded (1914) Image: University of Southampton. 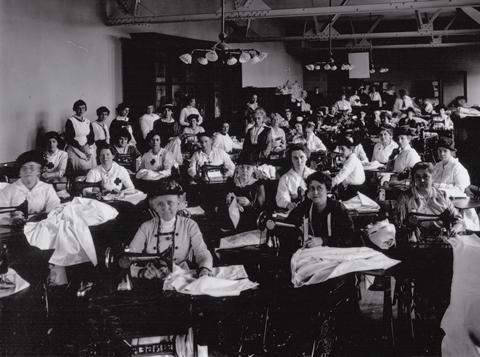 Women sew for the war effort in the old University of Toronto library. Image: U of T Magazine. 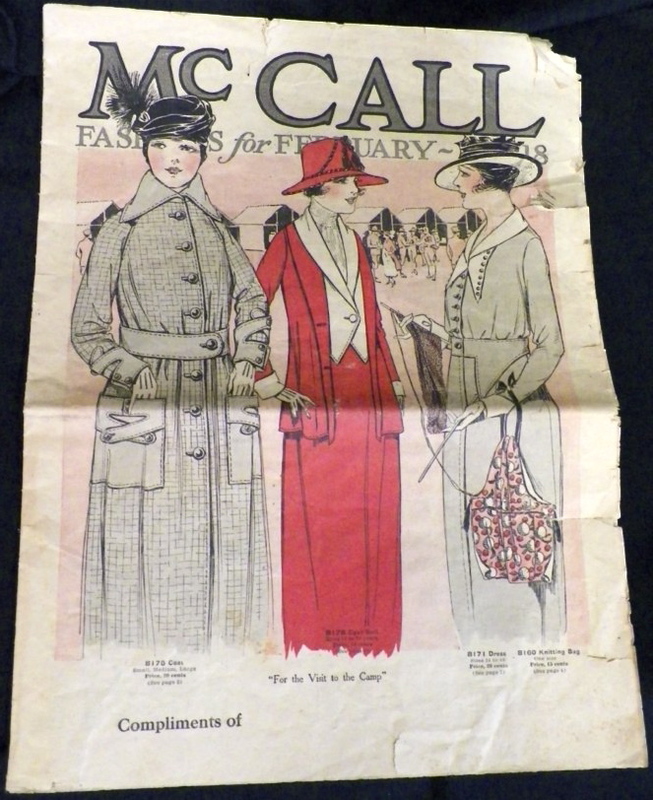 “For the Visit to the Camp.” McCall Fashions, February 1918. Image: eBay. New Official American Red Cross patterns. 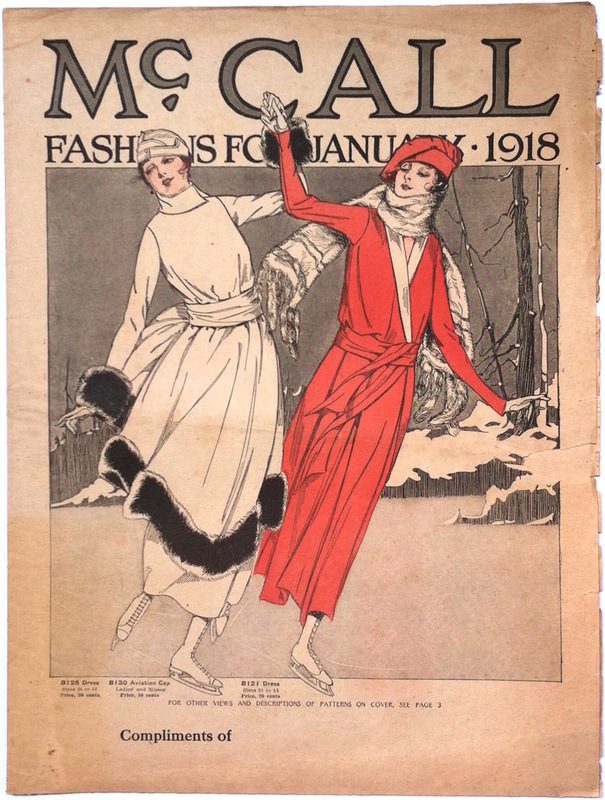 McCall Fashions, February 1918. Image: eBay. Drumright Evening Derrick, June 17, 1918. Image: Oklahoma Historical Society. McCall Red Cross 35 (ca. 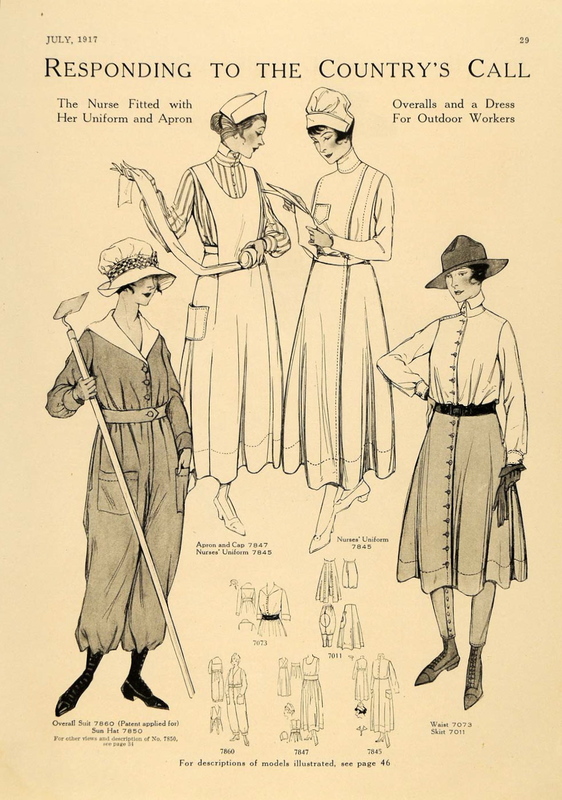 1917) Image: Unsung Sewing Patterns. 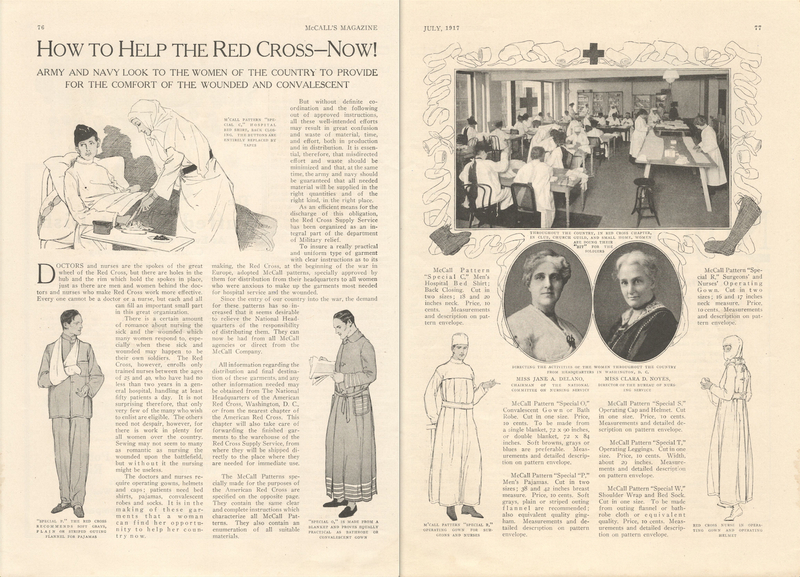 “How to Help the Red Cross–Now!” McCall’s magazine, July 1917. 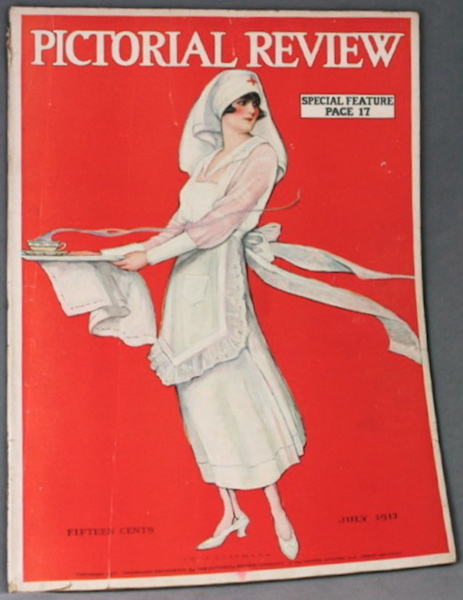 “Throughout the country, in Red Cross chapter, in club, church guild, and small home, women are doing their ‘bit’ for the soldiers.” McCall’s magazine, July 1917. McCall Special C (1917) Red Cross hospital bed shirt. McCall Special P (1917) Red Cross pajamas. McCall Special O (1917) Red Cross bathrobe or convalescent gown. 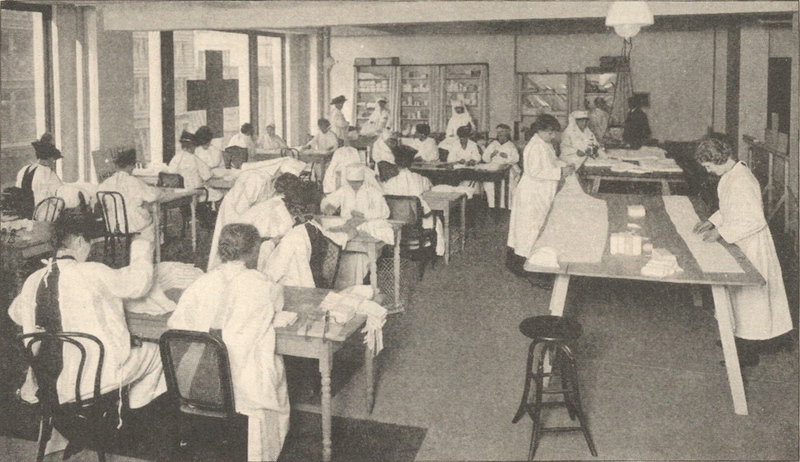 McCall Special R (1917) Red Cross operating gown. McCall Special R and S (1917) Red Cross operating gown and operating helmet. McCall Special R (ca. 1917). Red Cross Surgeon’s and Nurse’s operating gown. Image: Emery, A History of the Paper Pattern Industry. 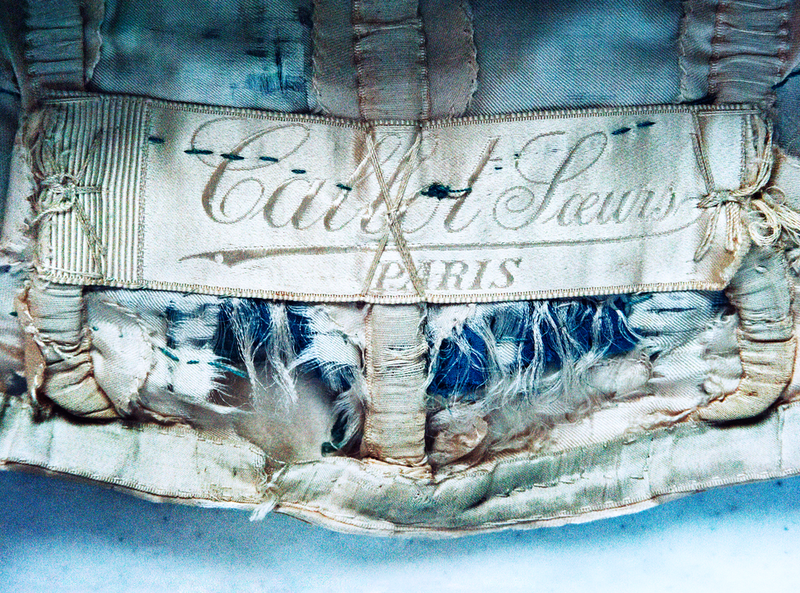 Do you have any World War I patterns in your collection? * Seligman, Cutting for All! (Southern Illinois UP, 1996), pp. 123-24, cited in Emery, A History of the Paper Pattern Industry (Bloomsbury, 2014), p. 91. 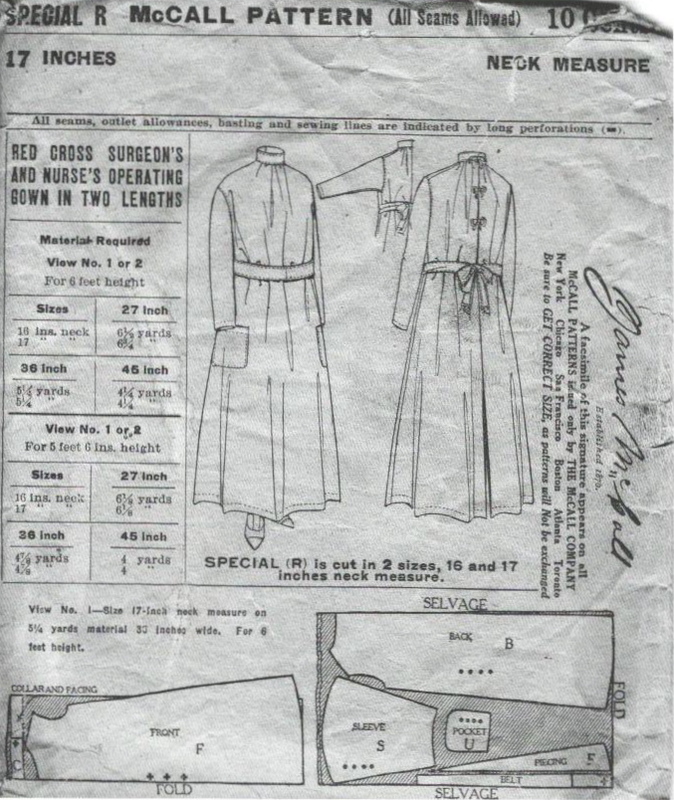 A digitized version of Emily Peek, Practical Instruction in Cutting Out and Making Up Hospital Garments for Sick and Wounded: Approved by the Red Cross Society (British Red Cross Society, 1914), is available through the University of Southampton.